VMware has announced the latest version of their End User Computing product Horizon View. RDS Hosted apps will allow Horizon View clients to access applications and full desktops running on Windows Remote Desktop Services Hosts. This is big news as it gives VMware a competing product to Citrix XenApp. For people who know about VDI, what is the difference? Well, VDI delivers an entire desktop to a particular user. This desktop is a whole virtual machine with an OS and applications. RDS (Remote Desktop Services) means using the capabilities of Microsoft RDS (previously Terminal Services) to allow multiple users to connect to a single OS but have separate private desktop instances and applications (the server doesn’t even have to be virtual but you’d be daft not to). With RDS you can display a full desktop but can also display just an application seamlessly without all the desktop stuff around it. You don’t need as many OS instances which means better resource utilisation as well as fewer Microsoft licenses. 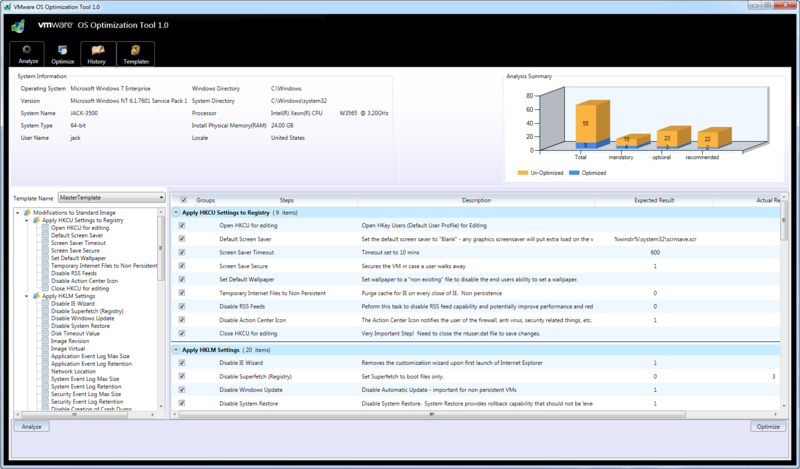 VMware has released a new Fling called the VMware OS Optimization Tool for Windows 7. One of my bugbears with the whole VDI industry is the I in “VDI”, Virtual Desktop Infrastructure. Many people often focus too much time and effort designing the infrastructure part of delivering virtual desktops: hypervisors, clusters, brokers, security, storage, networks, streaming, provisioning etc. and don’t pay enough attention to the actual OS build. The OS build is absolutely critical for the success of any VDI project. If you don’t optimise your OS image you will use more CPU, memory and critically storage IOPS than you actually need which can ramp up your costs or cause your whole project to fail. VMware has released the VMware OS Optimization Tool to assist with just this for Windows 7 desktops and VMware Horizon View. 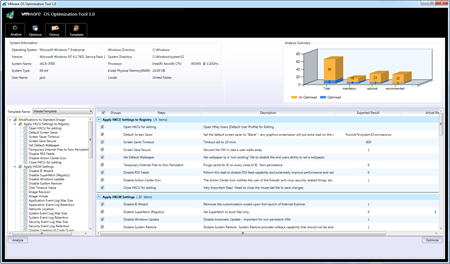 There are customisable templates to enable or Windows services and features to ensure you have optimum performance. There is also a Remote OS Optimization Tool which allows you to connect to a remote Horizon View broker to optimise images. Although this tool is specifically written for VMware View and uses VMware’s recommendations and best practices, the OS settings are as applicable when using Citrix XenDesktop or other brokers or in fact when running any Windows 7 workstation even without a broker when your users connect using just RDC. If you are wanting to get more information on your current Windows desktop (not only limited to VDI) performance, I would also suggest looking at Helge Klein’s fantastic UberAgent for Splunk which gives you all sorts of information to help find out what’s taking too long. VDI desktops in a XenDesktop environment need to be able to register with a controller or multiple controllers so they can be managed by the broker and allow connections by clients. In XenDesktop 4 the default was having the controller information held in an Active Directory OU. During installation you specified an AD OU and the controller installation added the AD objects to the OU so the Citrix Virtual Desktop Agent (VDA) that is installed within the guest OS could find the correct delivery controllers. I think storing the controller information in AD which was the default in XenDesktop 4 was a great way of doing things as it gave you one less client VDA configuration setting to manage. If the controller information is stored in the registry and you need to add or remove a controller you have to reconfigure every client which can be a lot of work. If the controller information is stored in AD you can amend the setting in AD and all clients will be able to find the new controller without any VDA configuration change. Citrix has released a Beta of their next major XenServer version called “Project Boston”. Citrix XenServer 5.6 Feature Pack 1 is the latest release of XenServer but it is not supported as a hypervisor with either XenDesktop 4 or XenDesktop 5. Have a look at the Citrix eDocs for Host Requirements / Hosting Infrastructure. 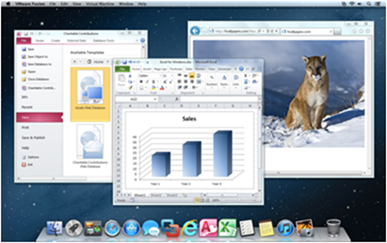 XenDesktop 5 was released on 3 December 2010. OK, that’s only 12 days before XenServer FP1 but surely Citrix would have made the enhancements to XenDesktop 5 to support XenServer 5.6 FP 1…obviously not. I’ve heard from Citrix that XenServer 5.6 Service Pack 2 is due for release soonish and will be supported by both XenDesktop 4 and 5. This does contradict somewhat with the release notes which state support will be in a newer version of XenDesktop rather than a newer version of XenServer. If you are running XenDesktop 4 or 5 with XenServer 5.6 as the hypervisor, don’t upgrade to Feature Release 1, rather wait for Service Pack 2. Citrix has just released some more information about its CPU masking technology for XenServer. Citrix calls it Heterogeneous resource pools which require a XenServer Enterprise or Platinum license. This technology is similar to VMware’s Enhanced VMotion Compatibility (EVC). These features use the capabilities built into the CPUs, either Intel’s FlexMigration or AMD’s Extended Migration to allow the configuration of a CPU to be changed by applying a CPU mask so it appears to provide different features than it actually does. This allows pools or clusters of hosts with different CPUs (from the same vendor) to support live migrations. This is extremely useful as even CPUs with the same model number can have some differences which could cause XenMotion / Vmotion to fail. Newer generation servers with faster CPUs and even additional cores can be added into existing pools / clusters without any downtime. Generally you need to start with hosts with the lowest capability CPUs and then add the newer revision ones which when added to the pool / cluster mask CPU features not available with the original CPUs. This can be done with all VMs online as the new hosts have the masks applied before any VMs start to run on the new host, maintaining compatibility with the existing pool /cluster. If you are adding older hosts into a pool / cluster you would need to amend the mask of existing hosts which would mean all VMs would need to be shut down for this to work as a guest VM cannot downgrade its CPU capabilities while running. Citrix has also helpfully released a Heterogeneous CPU Pool Self-Test Kit so you can check your CPU compatibility.